The transformed cargo ship MS Wissenschaft 2012 presents the exhibition Future Project Earth until July 29th in the traditional harbor in Hamburg. The Federal Ministry of Education and Research iniated the exhibtion about research of sustainable development. Exciting examples and ehibits invite the visitors to actively interact and respond to questions like how we should live and operate economically in order to save our environment. The exhibition opens its doors daily from 10 am to 7 pm. The entrance is for free. 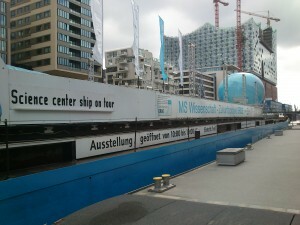 Until October 15th the ship will call at 30 other harbors across Germany.